The euro retreated against the dollar after the pair jumped sharply following the first Fed meeting this year. A pessimistic view on growth in developed economies and a dovish view on the path of interest rates in 2019, characterized with the key message “patience”, put the dollar under pressure. However, decelerating inflation and retail sales in the euro zone along with a dovish stance from President Weidmann of the Bundesbank undermined the common European currency. Despite the Greenback’s weakness earlier in the week, the U.S. dollar index recovered to the 95.6 point on Tuesday, supported by strong NFP figures on Friday. The British pound turned lower from recent highs as the default no-deal Brexit scenario approaches. 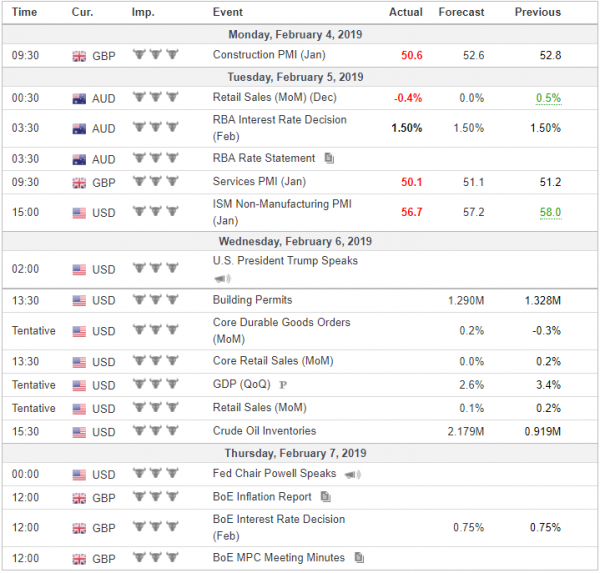 Negative noises from the European Union officials on the prospects of a new Brexit deal and disappointing manufacturing and services PMIs weighed on the British currency. The Japanese yen slightly weakened against the dollar. However the economic slowdown in China, the US-China trade war and Brexit have provided ongoing support for the yen so far this year. The Turkish Lira strengthened against the dollar. Investors were encouraged by Turkish banking sector profits which were up by 10% over the previous year. The Turkish Central Bank also stated it will maintain a tight policy stance after annual inflation came in slightly higher than expected at 20.35%. U.S. stocks rose last week mainly boosted by excellent business results and earnings of tech-giants and increased confidence that trade talks between US and China will result in a comprehensive deal. The S&P 500 recorded its best January performance since 1997. The earnings season continues this week with General Motors, Zynga and Twitter due to announce results. Oil prices were little changed last week but with sharp fluctuations. The US Oil rig count fell by 12 units last Friday to its lowest level in last eight months. On the other hand, Russia appears to be lagging behind its OPEC partners with production cuts. The country committed to gradually curb its oil production by 228,000 barrels a day from the October baseline within the first quarter. However, it lowered production by around 40,000 barrels-a-day in January, Bloomberg reported. In a volatile week Gold hit its highest level since May 2018 last Thursday before touching a weekly low on Friday, but has recovered since then. The precious metal has been affected by a turbulent dollar over the past seven days but remains well over the psychological 1300 dollar level.